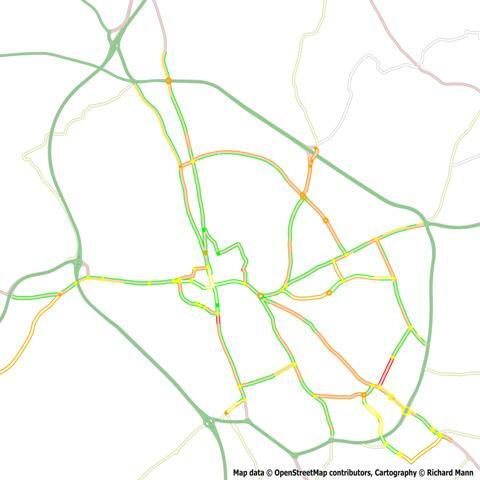 This map shows the current state of Oxford’s main road cycle network. About half the network is in Green, and has cycle lanes, bus lanes or priority cycle tracks. Yellow indicates non-priority cycle tracks (shared pavements), cycle lanes that are too close to parking, or pedestrianised streets with restricted cycling hours – these need review and improvement. Orange shows where cycle lanes could be installed (usually by restricting some parking, or replacing pedestrian refuges). The few sections of six-metre road are in red. Junctions are colour-coded in the same way – green are OK, yellow needs some attention, and orange needs quite a bit of attention. The next stage of developing the Total Cycling strategy is to list the areas needing attention, identify rough costs associated with likely treatment, and set out priorities and a program. There is a parallel analysis of routes to support family cycling, and access to employment sites away from the main roads. Quite an extensive network already exists, so the focus will be on areas where provision is notably absent, particularly around Cowley Centre, and on the main hospital sites.